I love burgers, and much like my love for pizza, I love all types: beef, chicken, veggie, and turkey. I would be lying if I said I didn’t have a favorite though. 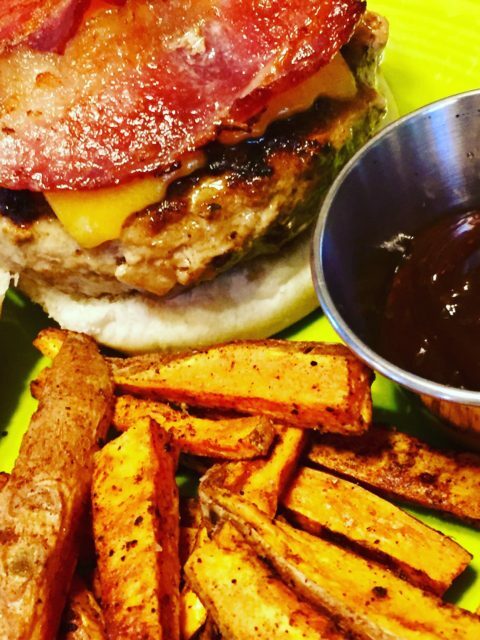 A thick, juicy, medium rare beef burger is top on my list, but this turkey burger is now rivaling my Four Cheese Chicken Burgers for second place. Face it, sometimes cooked ground chicken and turkey can be dry and a bit flavorless, even when you choose the less lean white and dark meat mixture. 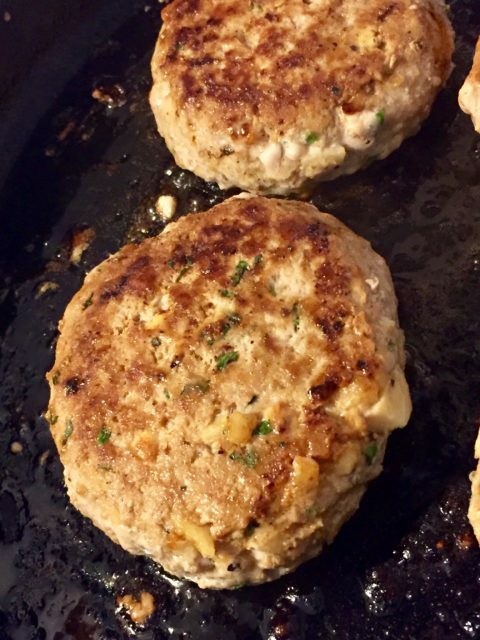 The key to making a great turkey burger is using ingredients that help keep the meat juicy and add great flavor. Unlike with beef, when you bite into a chicken or turkey burger, you aren’t expecting to taste good quality meat. So, you can have a little fun. There are Gre ek burger, Southwestern burger, and Italian burger recipes available just to name a few. This turkey burger combines one of my favorite fall flavors, apple, with the complimentary flavors of cheddar cheese, applewood bacon and BBQ sauce. The apple adds both flavor and juiciness, but isn’t over-powering. The fresh parsley also helps keep the meat moist, so this is one time that you wouldn’t want to substitute with dry. The feta takes the place of adding salt and also adds moisture. The blend of spices are a flavorful compliment the BBQ sauce. I enjoy grilling, but I prepared these burgers in a cast iron skillet that already had a generous coating of bacon grease from the slices I fried to top the burgers. It made for a tasty caramelization on the outside of the burgers that just added another layer of flavor. 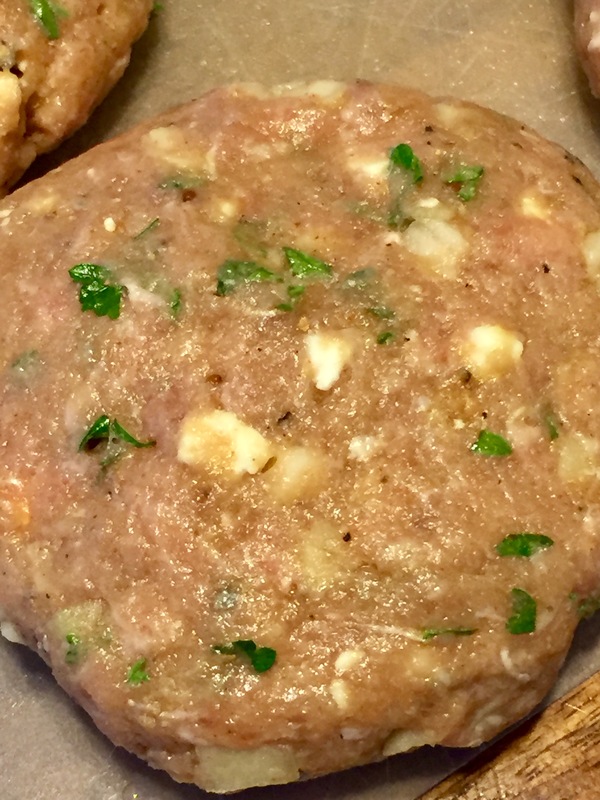 For turkey burgers, be sure to cook the burger completely to an internal temperature of at least 165 degrees. 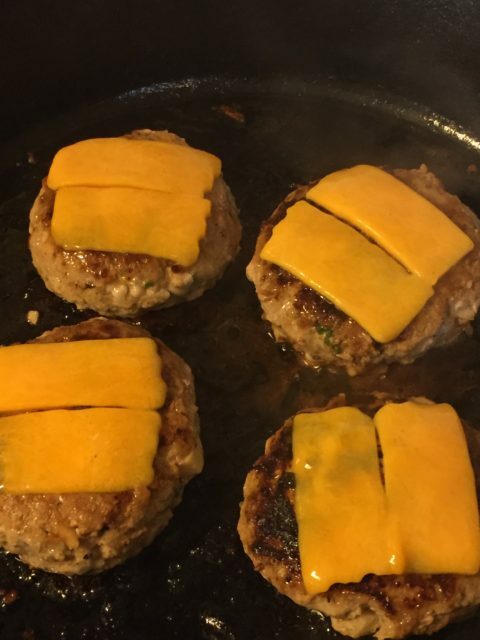 Mine took about 6 minutes per side plus the time it took to melt the cheese. Serve on a bun with your favorite BBQ sauce. To make your own BBQ sauce click here. Lettuce, onion slices, and mushrooms would be great toppers as well. I served the burgers with baked sweet potato fries. 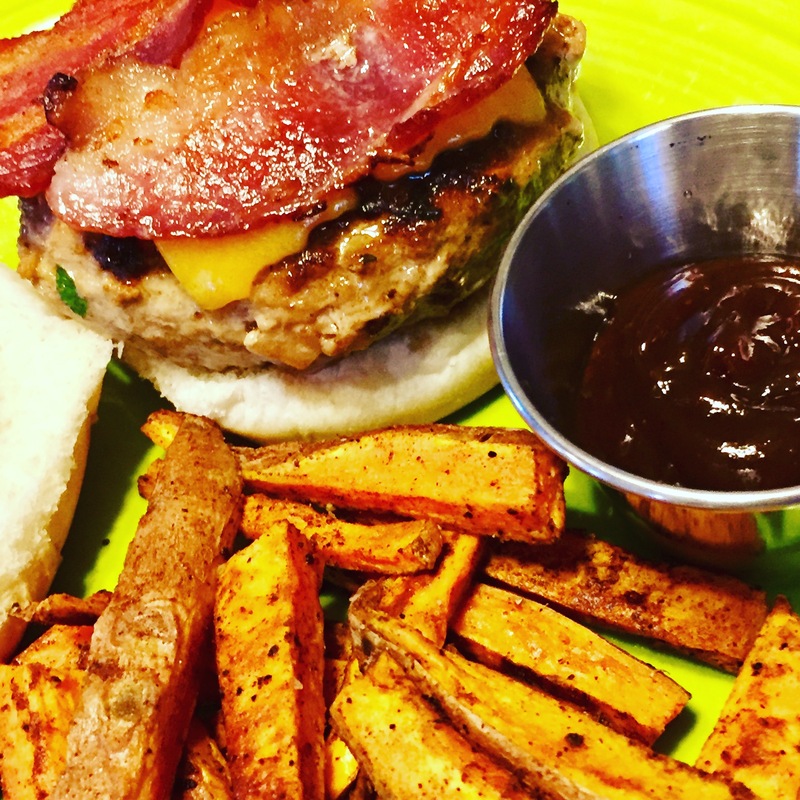 Turkey burgers packed with flavorful ingredients that help keep the burgers juicy topped with cheddar cheese, bacon & BBQ sauce.